Posted on November 8, 2017 by Terrazzo Restoration Posted in General	. 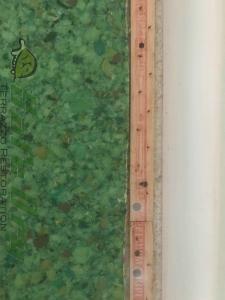 The proper way to install tack strip in terrazzo is to first drill and then use aluminum nails. The most common damage done to the state of Florida’s terrazzo floors is chip hole damage from pulling nails from tack strip that was installed on terrazzo floors and improper installation which causes holes in the floor. I wanted to cover a picture of those improper nails. 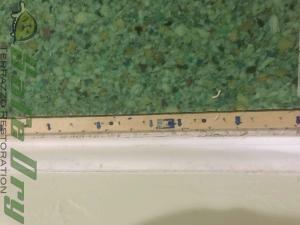 Often when installers put in carpet, they’ll install tack strip not made for concrete or terrazzo floors in the floors. Installers generally use wood tack strip. 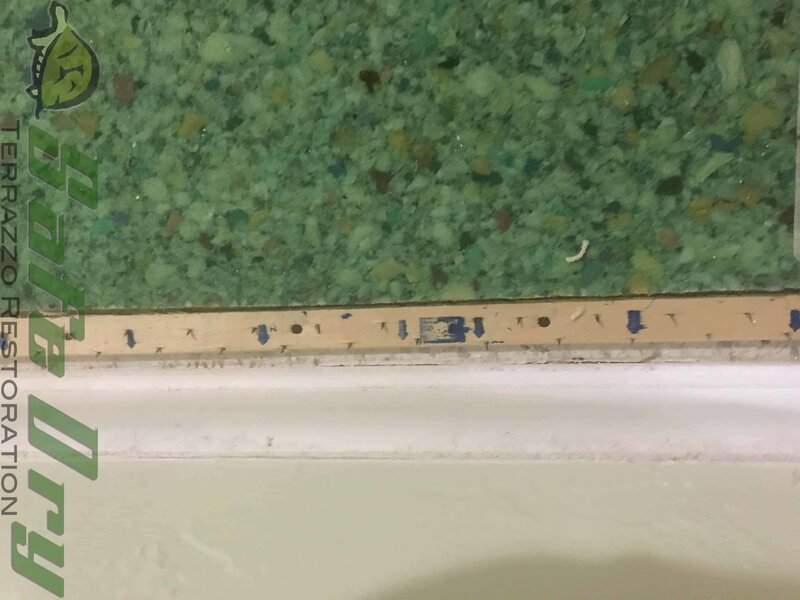 Installers will pound or shoot wood nails into the floor, frequently chipping the area in the terrazzo floor around the nail before we even have a chance to cut the nails off. 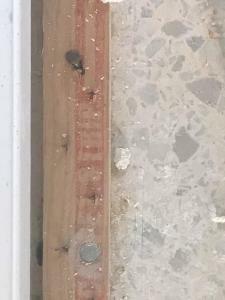 The proper way to remove tack strip in terrazzo floors is to pull out the strip and then cut the heads of the nails off. Even using this method, it’s impossible to avoid damage caused by tack strip the doesn’t use proper, concrete, nails. The black nails with the smaller heads are the improper nails for this terrazzo job. If you want to see if your tack strip was likely installed correctly, see if you have small black nails or larger silver nails. You can also pull up some tack strip to see if there is any evidence of damage from tack strip that has been pulled up in the past. At SafeDry, we remove fifty to seventy thousand chip holes from nails a year. We’d like to spread this information because we’d rather be working on the floor than repairing chip holes. Although we charge for chip hole repair, it’s not a profitable repair for us. If you pull a nail, you will cause damage. 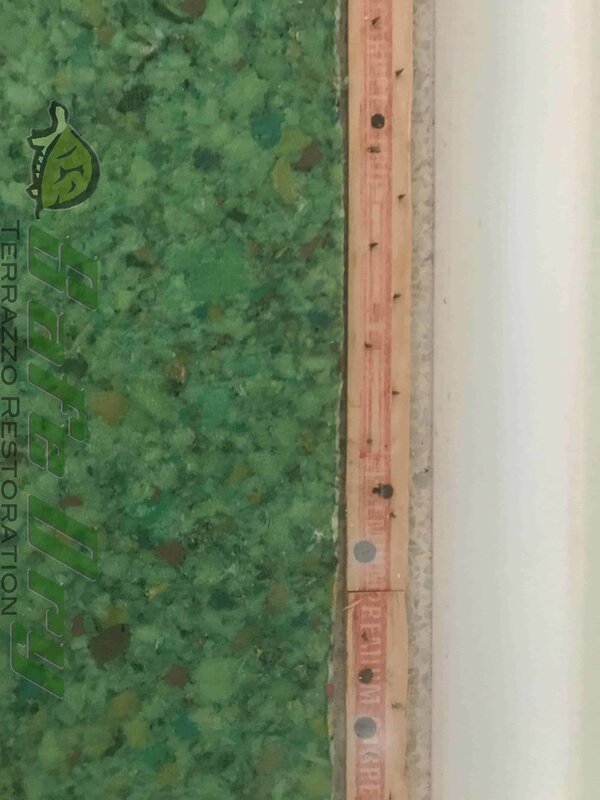 Pulling nails instead of cutting them is the #1 cause of terrazzo damage.